Commodity Trading News And Technical Analysis Reports. : Index outlook: Rocky Path Ahead For Indian Stock Markets. Sensex, Nifty. Index outlook: Rocky Path Ahead For Indian Stock Markets. Sensex, Nifty. 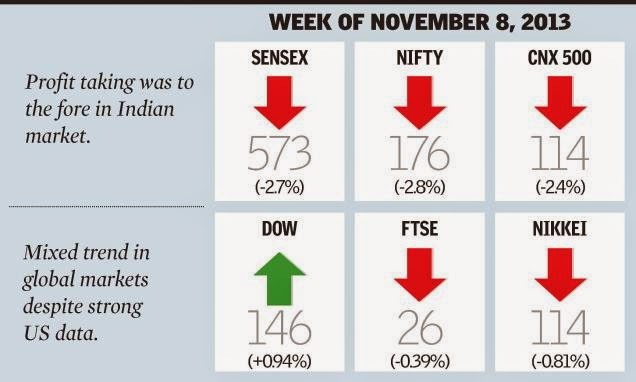 Investors straggling in to trade after Diwali celebrations were confronted with a sluggish market last week. Try as they might, experts, in their Diwali attire, were unable to convince either themselves or the investors that the Sensex and the Nifty deserve to trade at current levels. The frontline indices slid to close all the four sessions in the negative. Standard and Poor retaining its negative sovereign rating outlook for India and the HSBC Purchasing Managers Index showing that the economy is still contracting dampened sentiment. But there were other signs of unrest in the form of the rupee sliding down to 62.8 against the dollar and the 10-year government security yield spiking to 8.9 per cent. Market participants will now have to go back to watching and tracking global developments since it is the strong economic growth in the US for the third quarter that has made markets nervous globally. US GDP growing at 2.8 per cent in September quarter along with strong jobs data for October means that the Federal Reserve could broach the topic of QE tapering in its December meeting. The US 10-year bond yield also spiked to 2.75 per cent on Friday reflecting this expectation. This spells trouble for the Indian rupee as well as foreign portfolio flows into Indian debt. Turbulence is, therefore, expected in the Indian equity market as well in the coming weeks, if the rupee loses further ground. A surprise cut in policy rate by the European Central Bank by 25 basis points to 0.25 per cent due to slump in euro zone inflation to 0.7 per cent has added to the worry lines. The industrial production data and wholesale price inflation data due next week will give further cues about the health of the economy. The next batch of quarterly earnings is also likely to keep investors riveted. Foreign institutional investors are continuing to be net buyers in equity while they are net sellers in debt. The actions of these investors will also have an influence on the stock price movement. Oscillators in the daily chart have dipped into the negative from the bullish zone denoting a change in short-term trend. Daily price rate of change indicator has moved below zero and the moving average convergence divergence oscillator is signalling a sell. The weekly oscillators are, however, more strongly placed in the positive zone. This means that the medium-term uptrend is not under any kind of threat. The Sensex hit a new life-time peak at 21,321.5 on Diwali and has reverted back to where it was two weeks ago. Immediate support for the Sensex is at 20,500. The short-term will not turn overtly negative unless the index goes on to close below this level. If the index holds above 20,500, it will mean that the index can rally to 21,050 or 21,321 in the short-term. A sharp break above the previous high can take the index to 21,771. Downward targets on breach of 20,500 are 20,286 and then 20,046. The medium-term trend in the Sensex continues to be up. On extrapolating the up-move that began from the 15,135 low, we got the targets of 20,729 and 22,758. The minor wave from 17,448 had the targets of 21,299 and then 22,577. The index has achieved the first target under both the counts. It is possible that we already have an important peak at 21,321. But this point will be confirmed only if the index closes below 19,850. If the index holds above this level, it can try to move on to a new high over the coming months. The Nifty recorded the peak of 6,342.9 in the Diwali session before reversing lower. Immediate supports that traders need to watch are at 6,100 and 6,079. Reversal from these levels can take the index higher to 6,209 or 6,262. Inability to move above 6,262 will be the cue for traders to go short with stop at 6,270. Move above 6,262 can take the index to its previous peak of 6,342 and beyond that to 6,517. Targets on breach of 6,079 are 6,021 and 5,950. The medium-term trend in the index stays positive and will be under threat only if the index goes on to close below 5,900. But since some of the initial wave targets for the rally from 5,119 have already been achieved, investors and traders need to stay cautious. Many global benchmarks paused last week and gave up some gains. The CBOE volatility index has, however, withdrawn to the lower end of its current trading band at 13, implying that investors are sanguine despite the dizzy heights that stocks have attained. US stocks gave up some gains on Thursday after strong GDP numbers. But the mood turned buoyant again on Friday helped by good jobs data. The Dow has emulated the S&P 500 and is now closing at a record high. But it has not broken past the previous peak at 15,658 emphatically yet. The index is, in fact, moving in a trading range between 14,500 and 15,700 since April. Inability to move beyond 15,800 can drag it lower towards the lower end of this trading band. The sharp up-move in the dollar index to 81.4 on Friday does not bode well for the Indian rupee. Weakness in the euro following the ECB’s surprise move has led to a surge in the value of the green-back. Next resistance for the dollar index is at 82.7. The short-term outlook will turn positive once this level is crossed. The rupee hit the low of 62.8 against the dollar on Friday before closing at 62.5. Immediate supports are at 63 and then at 64. The short-term trend will reverse lower only if the currency moves below 64. But if this is part of the structural down-move in the currency since the 2011 peak, there is a strong possibility of a move to 65.8 shortly.